The game against the 49ers was especially exciting, not only because it was such a nail biter, but also because Corban decided that it was the perfect time to try and start standing without holding onto anything. Between cheering for him, and screaming for every touchdown, interception, or fumble, I had quite the sore throat the next day. Who knows? Maybe Corban will walk during the Super Bowl! This salsa is AMAZING. I don’t really need to say more, but I will. It’s full of flavor and texture, from bright red cherry tomatoes, juicy and sweet, to buttery and creamy avocado. There are crunchy bell peppers and spicy red onion and garlic. I use just a hint of cilantro, because Eric doesn’t like more than that, but you can use more if you so desire. 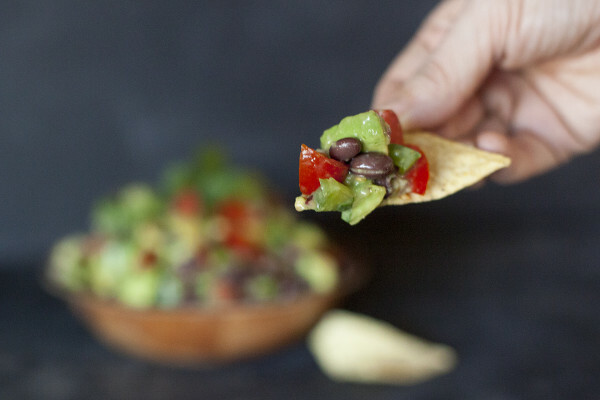 You can even add some jalapeno if you like things really spicy, but we prefer this version because it’s an easy healthy snack for kids and adults. Sometimes kids can’t handle the heat. As you can see, Corban loves this salsa. We just put some on his tray and he eats it with his fingers. He REALLY wanted to eat his with chips, like we were, oh boy is that child showing his strong willed side. We are in for a wild ride! (You can follow me on Instagram for more pictures of Corban meals which are great snacks and recipes for toddlers). We actually ate this for dinner last night. Corban got about 1/4 cup and Eric and I split the rest, so it can be a main dish too. I plan on making this again to try as a condiment for chicken or fish. I bet it would be amazing on fish tacos! Need even more Super Bowl recipes? Check out last year’s round up of Super Bowl recipe round ups! That’s right, links to hundreds of recipes! 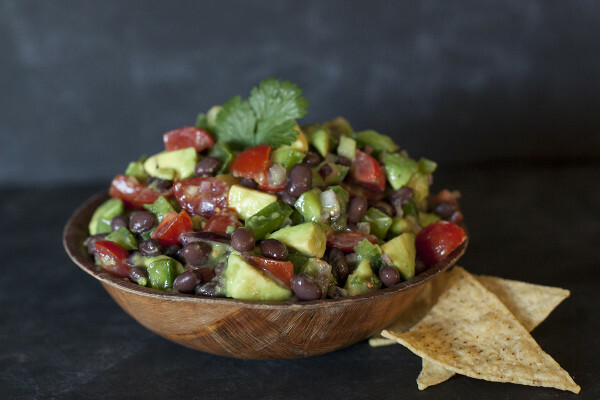 Do you have a favorite Super Bowl recipe for me to try? 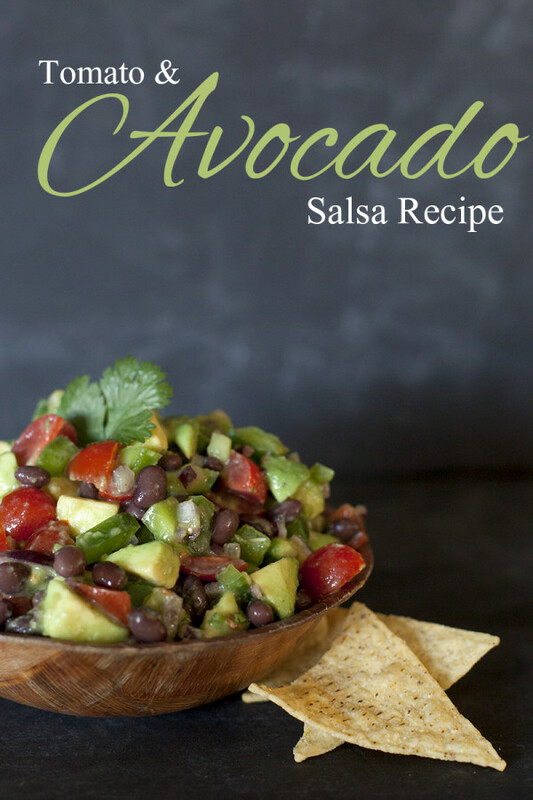 An easy fresh salsa that's a perfect snack for kids and adults to enjoy during the Super Bowl. Slice the tomatoes into quarters if their small and round, or eighths if they're the larger oval variety. Remove avocado from the peel and discard the pit. 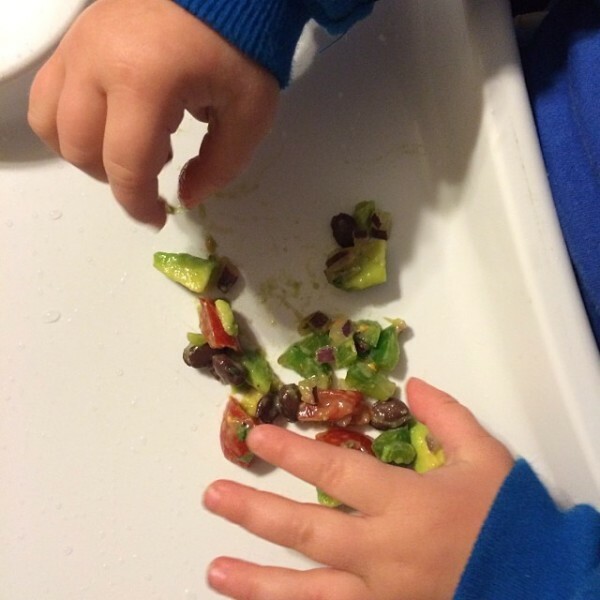 Chop avocado into half inch pieces. 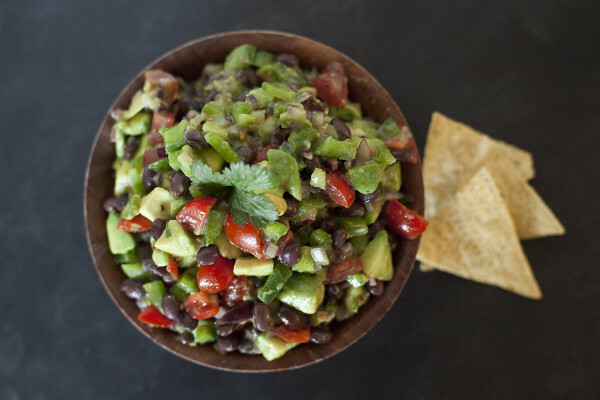 Add tomatoes and avocado to a large bowl. Rinse and drain the beans and add to bowl. Add the bell pepper, onion, garlic, cilantro, salt, pepper, and lime juice. Toss everything well. Taste and add more salt or lime juice as needed (I like to taste test with a chip since they are salty too). You can definitely serve immediately but I like to refrigerate it 1-4 hours to let the flavors really develop. Approximate cost/serving: Avocados are ALWAYS on sale this time of year. Pretty much all salsa ingredients are. This just cost me about $4 to make, even using organic ingredients. So $1 a serving. Hi Tonja, you could definitely skip the pepper, and even sub something like cucumber if you want for the texture and bulk. As for the cilantro, I have the same feeling. Don’t want to waste a thing! I try to plan a couple other recipes that week which will use the fresh herbs, and keep them in a glass with water in the fridge (use it like a vase). If you know you won’t use them before they go bad, just chop them up and freeze them in an ice cube tray with a little water. You can pop them out and store them in a baggie in the freezer, then have the herbs on hand next time you need them!